A scientist who has fronted programmes on everything from volcanoes to fracking, the geology of Africa and our use of oil has received a prestigious accolade. Iain Stewart, Professor of Geoscience Communication and Director of the Sustainable Earth Institute at Plymouth University, has been presented with the Senior Public Engagement Prize by the Royal Society of Edinburgh (RSE). The award is in recognition of his exceptional, wide-ranging public engagement through the medium of broadcasting and his work with school pupils and teachers. 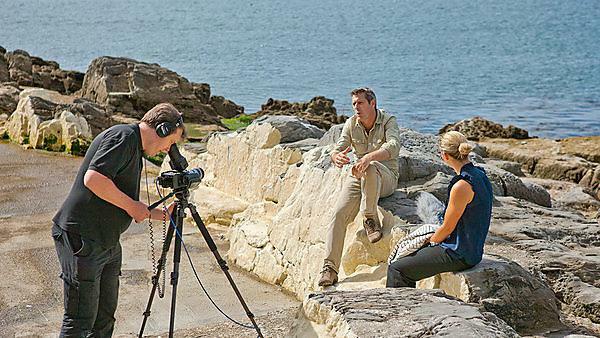 Professor Stewart’s broadcasting career began in 2002, with previous productions including Journeys from the Centre of the Earth, Earth: The Power of the Planet, Volcano Live and Rise of the Continents. His most recent programmes have had a tartan tinge, with his 2015 three-part BBC series Planet Oil: The Treasure that Conquered the World using the 50th anniversary of the North Sea oil industry to chart our global obsession with hydrocarbons whilst his latest documentary, showcasing the work of Scottish physicist James Clerk Maxwell, aired in January on BBC4. He was appointed an MBE in the 2013 Birthday Honours for services to geology and science communication, and is an active member of many educational organisations and charities, both in the South West of England and in his native Scotland, where he is President of the Royal Scottish Geographical Society. The RSE awards are presented to individuals at the height of their discipline, as well as those who are showing great potential in the early stages of their career. Representing areas as diverse as particle physics, entrepreneurship and race equality, they highlight the vitality and scope of Scotland’s academic sector. The overlapping diversity of disciplines here at Plymouth makes it a great place to study geology, and our fantastic geological ‘backyard’ is ideal for an outstanding range of fieldwork experiences.